The glandular anlage first appears in the form of solid epithelial buds in the 6 th embryonic week. During the 6 th -8 th embryonic week, the major salivary glands develop as outpouchings of oral ectoderm and grow inwardly into the surrounding mesenchyme. In the first stage, branching dichotomous ducts develop from salivary anlage. In the second stage, the ducts acquire lumen and gland lobules form, and this continues through the 7 th embryonic month. The third stage begins in the 5 th embryonic month with the differentiation of the acini and further maturation of the gland, together with a considerable reduction in initially abundant connective tissue. There are several controversies regarding the origin and morphogenesis of salivary gland tumors. The complexity of structure and the rarity in occurrence are a diagnostic dilemma for even experienced pathologists. The diagnostic criteria are overlapping, the classification systems are numerous, and the histopathological criteria may vary within the same tumor and in different areas of the same tumor. This article aims to review some of the concepts in histeogenesis of salivary gland tumors. Histogenetic concepts of tumor development are now ingrained in pathology and influence decisions on the structuring of tumor classification schemes. If a histogenetic concept is attractive in that it provides a ready explanation for subjective observations in histological sections, then it quickly becomes accepted, frequently quoted, and eventually established as fact, even in the absence of corroborative scientific evidence. Histogenesis correctly refers to the embryological formation and differentiation of tissue/organs, in tumor pathology this term has come to imply the putative cell of origin for a particular neoplasm [Table 1]. However, there is considerable evidence for a multicellular theory of tumor histogenesis. That is, any of "multiplicity of cell types in normal salivary gland have the potential to give rise to any of various types of tumors occurring in this organ." A number of factors affect the histologic feature of salivary gland tumors. In many cases, patterns of tumor differentiation reflect the bilayered cells composed of luminal or acinar cells and outer basal and/or myoepithelial cells. This histologic aspect is called ducto-acinar concept. The salivary gland exhibits two-tiered organization, which comprises luminal (acinar and ductal cells) and abluminal (myoepithelial and basal cells). The secretory acini and the intercalated ducts are wrapped by myoepithelial cells. The straited ducts and the down streaming conducting units are lined by simple or pseudostatified columnar epithelium which gradually transforms into the stratified squamous epithelium, in the salivary duct, and they are supported by basal cells. Myoepithelial cells are physiologically and functionally modified epithelial cells located between the luminal cells and basement membrane. They are stellate shaped with cytoplasmic processes embracing the acini, or spindle shaped surrounding the intercalated ducts. They possess a dual epithelial and smooth muscle phenotype characterized ultrastructurally by the presence of desmososmes, intermediate filaments, pinocytic vesicles and myofilaments. Myoepithelial cells produce an extracellular matrix such as basement membrane materials and myxoid substances leading to diverse histology of salivary gland tumors. They may also exert an anti-invasive effect in a neoplasm promoting epithelial differentiation, secreting proteinase inhibitor and suppressing angiogenesis. Modification of myoepithelial cell component is also evident from the immunohistochemical studies. Intermediate filament vimentin and glial fibro acidic protein are not expressed in the normal myoepithelium, both are readily detected in modified myoepithelial cells of pleomorphic adenoma and myoepitheliomas. P-63, high molecular weight cytokeratin (CK-14) are positive for myoepithelial cells. Other myoid markers are calponin, actin, myosin, S-100 and Glial Fibro Acidic Protein (GFAP). The luminal cells are readily highlighted by immunostaining for cytokeratin, carcinoembryonic antigen (CEA), and epithelial membrane antigen (EMA). CD117/c-kit is negative in the normal salivary gland cells, however, is interestingly positive in the luminal (glandular) cells of various types of salivary gland tumors. The third process produces tumor cells resembling normal myoepithelial and/or basal cells. Some salivary gland tumors display an overlap in terms of cellular differentiation. For example, neoplastic myoepithelial cells in both AdCC and basal cell adenoma can participate in formation of glandular lumens. This observation emphasizes the central role of tumor cell differentiation in these neoplasms, as it suggests that any tumor cell has the potential to differentiate into at least two directions-ductal or myoepithelial/basal-or assume a hybrid form. Transformation or the process of metaplasia in, which one type of specialized cell modifies to assume characteristics of another cell type. Primarily, monocellular salivary gland tumors are composed either of luminal type cells, with or without acinar differentiation or of the neoplastic counterpart of myoepithelial and/or basal cell [Figure 1]. It is composed solely of myoepithelial-type and/or basal-like tumor cells. The presence or absence of significant amounts of specifically localized proteoglycans, basal lamina, other collagens and elastin in relation to the neoplastic myoepithelial/basal cells provides the other major criterion for classification [Figure 2]. In addition to the combinations of luminal and myoepithelial/basal cell differentiation in these tumors, the type and extent of synthesis as well as the distribution of extracellular materials considerably influence the final histology of salivary gland tumors. The presence or absence of significant amounts of specifically localized proteoglycans, basal lamina, other collagens, and elastin in relation to the neoplastic myoepithelial/basal cells provides the other major criterion use-in describing these tumors for classification purposes [Table 2]. Accumulated basal lamina and glycosaminoglycans may be present in certain bi-cellular and predominantly myoepithelial/basal cell neoplasms and absent in others. Both the degree of synthesis of these materials and the nature of their containment between the myoepithelial and/or basal cell compartment influences the final morphology of a particular salivary gland tumor class. In AdCC, well-controlled localization of proteoglycans and basal lamina occurs, whereas in pleomorphic adenoma, excessive production forces separation of adjacent tumor cells and the eventual development of myxochondroid zones. Salivary gland tumors are relatively rare and diverse group of lesions with unresolved intricacies from its development to maturation. The pathologists usually encounter benign neoplasms and very few experience full range of salivary cancers which are best managed in specialist centers. The modern approach is more realistic, in that histological typing is based on cellular differentiation rather than cell of origin. Immunohistochemical staining has only limited role in diagnosis of salivary gland tumors. Ki-67 proliferative index may be useful in distinguishing an adenoma from a carcinoma (Ki-67 index usually <5% versus >10%). Salivary gland tumors offer a mydraid of diversity thus maintaining the ambiguity of these neoplasms. Still the enigma of diagnosing the salivary gland tumors continues challenging Oral Pathologists in routine practice. It is important for the pathologist to assess the cytoarchitectural features and cytoarchitectural profile of these neoplasms and correlate them with histiognetic concepts for better understanding which in turn will help in diagnosis and management of these lesions. 1. Dardick I. Histogenesis and Morphogenesis of salivary gland neoplasms. In: Ellis GL, Auclair PL, Gnepp DR, editors. Surgical Pathology of the Salivary Glands. Philadelphia: W.B. Saunders; 1991. p. 108. 2. Jaskoll T, Leo T, Witcher D, Ormestad M, Astorga J, Bringas P Jr, et al. Sonic hedgehog signaling plays an essential role during embryonic salivary gland epithelial branching morphogenesis. Dev Dyn 2004;229:722-32. 3. Eversole LR. Histogenic classification of salivary tumors. Arch Pathol 1971;92:433-43. 4. Attie JN, Sciubba JJ. Tumors of major and minor salivary glands: Clinical and pathologic features. Curr Probl Surg 1981;18:65-155. 5. Regezi JA, Batsakis JG. Histogenesis of salivary gland neoplasms. Otolaryngol Clin North Am 1977;10:297-307. 6. Batsakis JG. Salivary gland neoplasia: An outcome of modified morphogenesis and cytodifferentiation. Oral Surg Oral Med Oral Pathol 1980;49:229-32. 7. Batasaki JG, Chinn EK, Weimert TA, Work WP, Krause CJ. Acinic cell carcinoma: A clinicopathological study of 35 cases. J Pathol 1986;148:307-20. 8. Batsakis JG, Luna MA. Low-grade and high-grade adenocarcinomas of the salivary duct system. Ann Otol Rhinol Laryngol 1989;98:162-3. 9. Batsakis JG, Wozniak KJ, Regezi JA. Acinous cell carcinoma: A histogenetic hypothesis. J Oral Surg 1977;35:904-6. 10. Eversole LR. Histogenic classification of salivary tumors. Arch Pathol 1971;92:433-43. 11. Batsakis JG, el-Naggar AK, Luna MA. Adenocarcinoma, not otherwise specified: A diminishing group of salivary carcinomas. Ann Otol Rhinol Laryngol 1992;101:102-4. 12. Tortoledo ME, Luna MA, Batsakis JG. Carcinomas ex pleomorphic adenoma and malignant mixed tumors. Histomorphologic indexes. Arch Otolaryngol 1984;110:172-6. 13. Denny PC, Chai Y, Pimprapaiporn W, Denny PA. Three-dimensional reconstruction of adult female mouse submandibular gland secretory structures. Anat Rec 1990;226:489-500. 14. Denny PC, Chai Y, Klauser DK, Denny PA. Three-dimensional localization of DNA synthesis in secretory elements of adult female mouse submandibular gland. 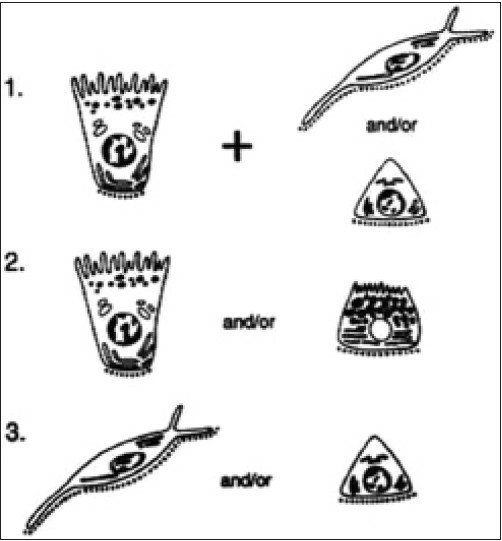 Adv Dent Res 1990;4:34-44. 15. Walker NI, Gobé GC. Cell death and cell proliferation during atrophy of the rat parotid gland induced by duct obstruction. J Pathol 1987;153:333-44. 16. Walker NI, Pound AW. An autoradiographic study of the cell proliferation during involution of the rat pancreas. J Pathol 1983;139:407-18. 17. Dardick I, Jeans MT, Sinnott NM, Wittkuhn JF, Kahn HJ, Baumal R. Salivary gland components involved in the formation of squamous metaplasia. Am J Pathol 1985;119:33-43. 18. Sigler RE, Newkirk C, McDowell EM. Histogenesis and morphogenesis of epidermoid metaplasia in hamster tracheal organ explant culture. Virchows Arch B Cell Pathol Incl Mol Pathol 1988;55:47-55. 19. Burford-Mason A, Dardick I, van Nostrand P. Salivary gland neoplasms - Stem cell histogenesis? J Laryngol Otol 1990;104:521-3. 20. Batsakis JG, Ordonez NG, Ro J, Meis JM, Bruner JM. S-100 protein and myoepithelial neoplasms. J Laryngol Otol 1986;100:687-98. 21. Dardick I, Burford-Mason AP. Current status of histogenetic and morphogenetic concepts of salivary gland tumorigenesis. Crit Rev Oral Biol Med 1993;4:639-77. 22. Dardick I, van Nostrand AW. Myoepithelial cells in salivary gland tumors - Revisited. Head Neck Surg 1985;7:395-408. 23. Dardick I, van Nostrand AW. Morphogenesis of salivary gland tumors. A prerequisite to improving classification. Pathol Annu 1987;22:1-53. 24. Cheu W, Chan JK. Salivary gland tumours. In: Fletcher CD editor. Diagnostic Histopathology of Tumours, 2 nd ed. London: Churchill Livingstone; 2000. p. 231. 25. Cheuk W, Chan JK. 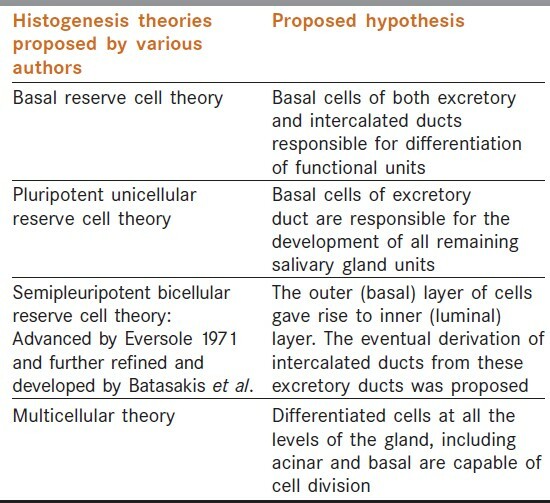 Advances in salivary gland pathology. Histopathology 2007;51:1-20.